There have been 47,437 forest fires this year. That is the smallest YTD total since the National Interagency Fire Center started tracking it in 2003. It is almost 25% below the mean and about one fourth of the 1938 total. I live three miles from what was mindlessly described in June as Colorado’s largest fire on record. The usual crew of idiots declared that the fire would burn until the winter snows, but the fire was completely extinguished by summer rains by mid-July. 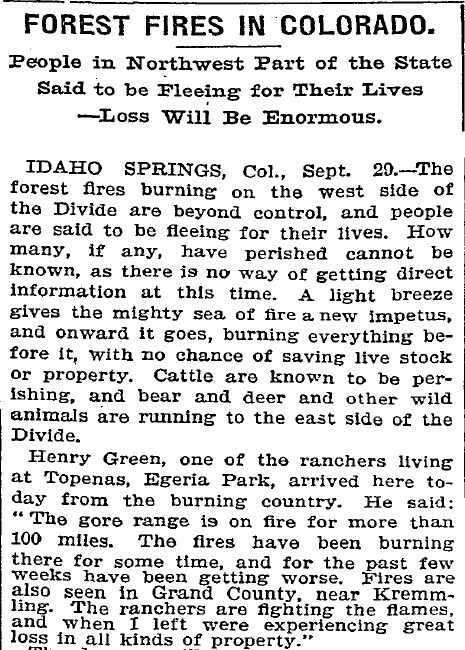 In late September 1898, a forest fire burned the entire northwest quadrant of the state. This year’s fire was about 1% that size, and it is cool and wet here in late September, 2012. Our alarmist friends feel the need to lie about everything. That doesn’t stop the MSM hysteria about every fire being the end of the world and directly related to “climate change”. Climate change that produces records for fewest fires, hurricanes and tornadoes can’t be all bad, assuming it is happening at all. Fire is an essential part of the pine forest cycle. The forests would die out without periodic fires. Should that be 1903 (some time before 1938)? Harry, the NIFC only started tracking them in 2003, prior to that I assume the forestry service did. Sorry, but I thought my point would be obvious to old science hands. “… this year…. is the smallest YTD total since …2003” is how the post above starts. My reaction is, that’s a 9 or 10 year period, and obviously not worth talking about. Only when one finds, in the following sentence, that Steven has gone to the trouble of calculating a mean (why do that, just for the last 10 years? ), and then the mention of 1938, does it become clear that a much longer time frame is being considered. So my bottom line is, why even mention 2003? Just because some agency only started its tracking in 2003? That is by-the-way information about the latest record-keeping agency, not about the forest fire record itself — and therefore not germane to analysis of that data. I have only come back to make this comment because this article was picked up by Climate Depot, with the sentence containing 2003 given prominence there, and I don’t like to see potentially misleading information spread to an often undiscerning — or even hostile — lay public (especially by a site that has done as well as this one has in recent months, in revealing fraudulent data manipulation by our most authoritative atmospheric and climate science institutions). I didn’t do any calculations. All time periods have limitations. There is nothing misleading or inaccurate. I expect people to use their brains. They actually been tracking it longer, but the data seems hidden a bit. This proves that AGW causes more precipitation and flooding. Hence fewer fires. Well, isn’t that cute, our NIFC is doing their own cli-sci. It’s so interesting to watch a federal agency grow up to be it’s own history revisionist. Look at 1983 and 1984. 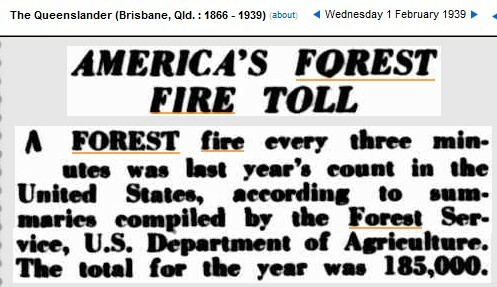 Oh, don’t y’all worry now, by mid-October we’ll have had UNPRECEDENTED forest fires this year! Wait till those Santa Ana winds get going.